Once you get the hang of it, pizza is really easy to make. It takes time, especially if you want to cook it the same night you mix up the dough, but if you make it on a regular basis you can make the dough ahead of time and just have it there when you're ready for it. In fact, the longer the dough sits in the refrigerator, the better pizza I think it makes. And, as with many things, less is usually more. A few simple, basic ingredients makes an outstanding pie. There are many ways to make a pizza, and as I have been experimenting I don't make it the same way twice (other than the dough, of course). But at the same time I have been experimenting, I have also been developing a basic cheese pizza that is my fall-back for when I don't have a lot of new, exotic ingredients to try, or just don't feel like messing with anything fancy. It doesn't take a whole can of tomato puree to make one batch of pizzas. I just put the rest in a container and leave it in the refrigerator for the next batch. 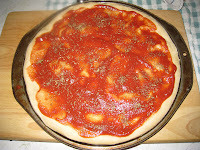 If too much time passes before I make another pizza, I will use the tomato puree to make pasta sauce or add it to a vegetable sauce. A little bit of tomato is never a bad thing to have hanging around. If you decide to tackle pizza, I hope you have fun playing around with all the different things you can do with it. But if you're a little nervous about it, and want to start with the basics, here's a nice, standard guide to get you started. 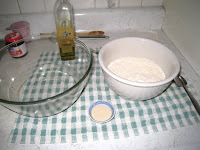 You can find the recipe for the dough here. Note the updated amounts on the white whole wheat and the bread flours. So here's the mise en place for the dough. As you can see, there's not a lot there. The bowl on the left has the water; the bowl on the right has white whole wheat flour, bread flour (this is Bob's Red Mill Brand; I just bought a bag of King Arthur's to compare), salt and sugar. Whisk all of those dry ingredients together before you get started. Waiting in the wings are the active dry yeast and olive oil. Warm the water (I zap it in the microwave for 1 minute) to between 105-115 deg. 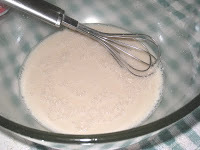 F.
Add the yeast to the warm water and whisk them together vigorously. In the olden days, you would combine the yeast, sugar and water in a little bowl to proof the yeast to make sure it is still alive, but if you are sure your yeast is fresh, these days it is not necessary to proof it. As you're whisking in the yeast, you should notice bubbles forming (click on the photo to see what I mean). That should be proof enough. 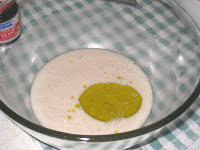 Once the yeast has mixed thoroughly with the water, you can add the olive oil. That's 2 tablespoons of olive oil. I just dump them right into the bowl. It kind of sits there on top, since oil is lighter than water, but that's ok. It will blend in when you add the dry ingredients. Which you should do next. Normally, you should add the dry ingredients in smaller increments because you never know for sure how much you're going to need. Depending on how humid it is or how you've measured out your flour, sometimes you need more or less. That is why some people say you should always weigh your dry ingredients rather than measure them. I grew up measuring, so I'll most likely continue to do it that way. Whatever floats your boat. But for pizza dough, I just dump all of the dry ingredients in at once. So far it hasn't been a problem. At this point I switch to a wooden spoon and stir until a soft dough forms. Sometimes it forms faster than others, and sometimes it forms more easily than at other times. For those times when the dough just isn't coming together, I will get rid of the spoon and start kneading it together in the bowl with my hands. It doesn't really matter how you make it happen; at this point you can't overwork the dough. 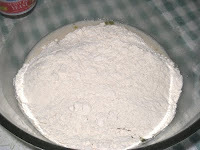 Next, turn the dough out onto a well-floured surface, and then sprinkle flour over the dough as well. That should be just about all of the extra flour you will need. You want the dough to be a little moist, but not so moist that it sticks to your hands. Start kneading the dough. 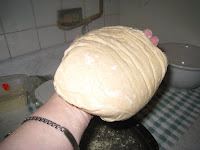 You knead by taking the end of the dough furthest away from you and folding it over towards you, then with the ball of your hand(s) you push it into the dough. Then you turn the dough one quarter and repeat. 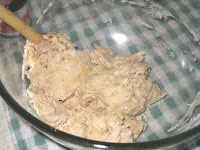 You want to knead the dough until it is smooth and elastic. Through practice, I have established that my dough gets nice and smooth and elastic after about 300 kneading strokes, so I just count them out. I don't know how long it takes, but it isn't really long at all. 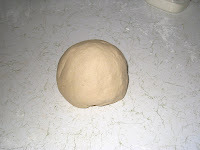 Before you know it you have a nice, smooth ball of pizza dough. Notice that virtually all of the flour that I had scattered on the counter has been absorbed into the dough. 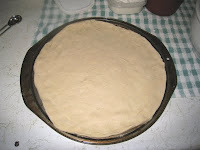 If you want to make your pizza right away, you would cover the dough in the bowl in which you mixed up the dough and let it rise to double its height (about an hour), and then you can pick up down below where you shape the dough into the pizza pan. 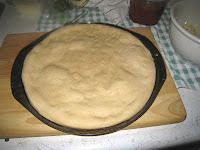 I think the dough is much better if you make it ahead of time and let it rise in the refrigerator overnight, or for a couple of days. Some say the flavor has time to develop more fully over time. I agree. 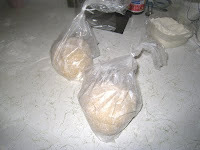 So I cut my ball of dough into two smaller balls and dust them with flour. I put each ball in a storage bag, and then tie the bag closed. The instructions I have seen say to wrap the balls tightly and then seal them. I tried that once and I thought the dough was going to burst out of the bag. 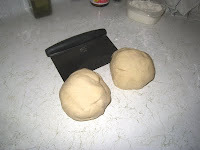 Instead, I squeeze the air out of the bags, but leave room in them for the dough to expand. That seems to do the trick. I put them in the bottom shelf of the refrigerator and forget them until I am ready to make my pizza - at least 8 hours, as long as 3 days. When I am ready to make pizza, I take the dough out of the refrigerator. I set my timer for an hour and leave the dough to come to room temperature while I go take care of other things. You can see how much the dough has risen, even in the refrigerator. Realizing that you can let dough rise in the refrigerator has liberated me with my breadmaking and other yeast-related goodies. If I don't have time to complete the full process at one time, I can just put it in the refrigerator until I am ready to pick it up again. Within reason, of course. After the 1-hour timer goes off, I reset it for half an hour. At this time I turn on the oven and set it at 450-475 deg. F so it can start preheating. Also at this time, I grate the cheese (if I don't already have some grated cheese on hand) and get all of my other ingredients together. 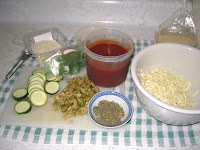 Here are the ingredients that are going into this baby: Tomato puree, salt (oops, not pictured), dried Italian spice mix (I make it myself - 2 parts oregano to 1 part basil and 1 part thyme), grated mozzarella cheese, sliced zucchini, chopped olives, fresh basil (lucky me - I had some on hand! ), and grated parmesan cheese. Usually, the 30-minute timer goes off just about the time I've assembled all the ingredients and have them ready. 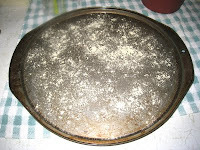 I sprinkle a little cornmeal over my baking dish to keep the pizza from sticking. I've learned not to use too much, or my pizza can taste a little too grainy. A little grainy is good - it reminds me of the pizza they serve at the pizza place, but you don't want too much. 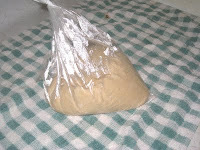 I start by sprinkling a little bit of flour into the bag and then putting my hand into the bag, turning the floured side over so the bottom of the bag is on top. 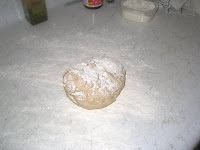 I carefully peel away the bag, and then sprinkle a little bit of flour on the newly-exposed side of the dough. 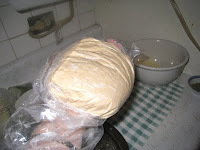 Then I grab it in the middle and start turning it around, letting the dough lengthen and fall a little more with each turn. I have not come anywhere close to mastering the technique that will let me shape my pizza that way, though, so after it has formed a round, flat shape, I put it into the baking sheet and stretch it out from there. One trick I have learned is to take the dough from the middle and stretch it out to the edge. If you just start pulling the edges it stretches out the middle too fast and it will start to tear before you can get the dough out to the edges of the baking sheet. Start in the middle, and the dough stays thicker all the way through, and you can still get that pizza crust thing going on the edges. Sometimes the dough will fight me a little. As you can see here, it isn't staying all the way out to the lip of the sheet. When that happens, I just cover it with a towel and walk away from it for 5 minutes. By the time I get back it has relaxed enough that I can stretch it out that last little bit so it comes out to the edges of the sheet. I like to pre-cook my crust, so I put it on the bottom rack of the oven and cook it for 4 minutes. 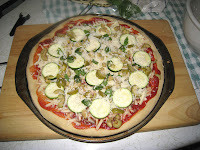 I got this tip watching Sarah Moulton make pizza on her PBS show "Weeknight Meals." Since I don't use a stone and I don't know that my oven gets really hot enough for professional quality pizza, I find that cooking it before I top it keeps it crisp while everything else is cooking. You may find that this step is not necessary, in which case, you can just skip it and start topping your pizza. The first thing I put on my pizza is the tomato puree. I use it straight out of the can. Some people like to make fancy sauces, and sometimes I will do that, but the tomato will cook in the oven and this is really fast and easy. Just be sure to season your puree! The first time I used it I forgot and it wasn't quite so spectacular. You want a light hand with the sauce. If there's too much sauce, your crust will be soggy and won't support the ingredients. I usually use a ladle to spoon it over and smooth it out; 2 ladles full is usually enough ( 3/4 to 1 cup). I season my tomato with salt and the Italian spice mix. I use both items generously and I make sure every bit of the sauce is well seasoned so there is flavor in every bite. 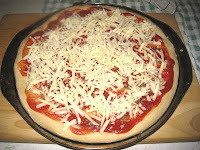 Next, I cover the tomato puree with the grated mozzarella cheese. I start from the outside and work my way in so the cheese covers all of the tomato sauce. For some reason, I don't know why, if I start in the middle and work my way out I don't go all the way to the edge of the tomato sauce. And you want to make sure that the cheese covers all of the sauce so it will cook together into a delicious gooey pizza edge. After the cheese come whatever ingredients I have decided to use. In this case, I had some zucchini and green olives in the refrigerator, so I sliced up the zucchini and chopped the olives. 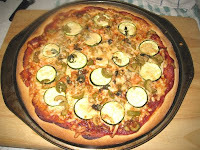 I just layer the slices evenly around the dough, and then I spread the olives evenly after that. I don't always have fresh herbs on hand, but having basil meant I could also chiffonade some basil leaves and spread those on top of the zucchini and olives. Last of all comes the grated parmesan cheese, so it will bubble and brown and give my pizza a nice, cheesy top. I bake it on the bottom shelf of the oven for about 15 minutes, until the crust is a deep golden brown, the pizza ingredients are done, and the cheeses have melted and are bubbling. 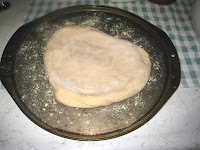 Remove the pizza from the oven and slide it off of the baking dish. Cut immediately and serve hot. To reheat, I have found that what works best for me is to preheat the oven to 350 deg F. and heat the slices on a baking sheet for about 10 minutes. 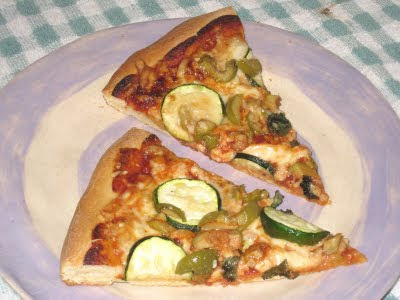 I used to reheat pizza in the microwave, but it really makes a difference if you heat it in the oven instead. Yum! Love your crust recipe! I agree with you about the microwave. Have you tried reheating in a skillet? I use a non-stick pan with a lid. Flip it over at the end and press it down with a spatula - you get this amazing toasted cheese crust on top. Almost better than when it's fresh, and you don't have to heat up the oven. It's also much faster. I'm glad you like the crust recipe, Suzy. I'll have to give that a try. Thanks for the tip!